Woohoo! You've reached this page because you are an action taker and you believe that our school can help you (or your family members) have fun, learn cool stuff, and provide an atmosphere that's so positive you can't help but smile! In addition to teaching awesome martial arts and self-defense classes, we want you to feel at home and look forward to just having a great experience with us! Below is our introductory offer for new students! This is a no risk, money back guarentee offer, so you have nothing to lose! Our programs (ages five to adults) are designed to positively impact all our students! Learn to become more discipline, more focused, more physically active, and of course learn real self-defense skills! We know that you visting our special offer is no mistake! You have goals for you or your family that you are ready to start achieving and you want someone to help you achieve your goals! We are ready to work with you and your family! Please complete the form to register for your four weeks of unlimited classes with a uniform! This trial is for our Tigers (5-7), Youth (8-13), and Adult Training Programs (14+). Come see why we have over 100 5-Star reviews on Facebook and Google! After you complete your purchase just reply to the confirmation email and let us know when you want to start! We want to make this an easy decision for you! If you have any specific questions please email MsCindyBRSD@gmail.com and we will get back to you very quickly! Outstanding place for your children to get an amazing training. All the staff is well trained, kind and courteous. They take the time needed for each individual child. Positive reinforcement and discipline at its finest! They are absolutely wonderful with my son. Can't wait for my daughter to be able to join! 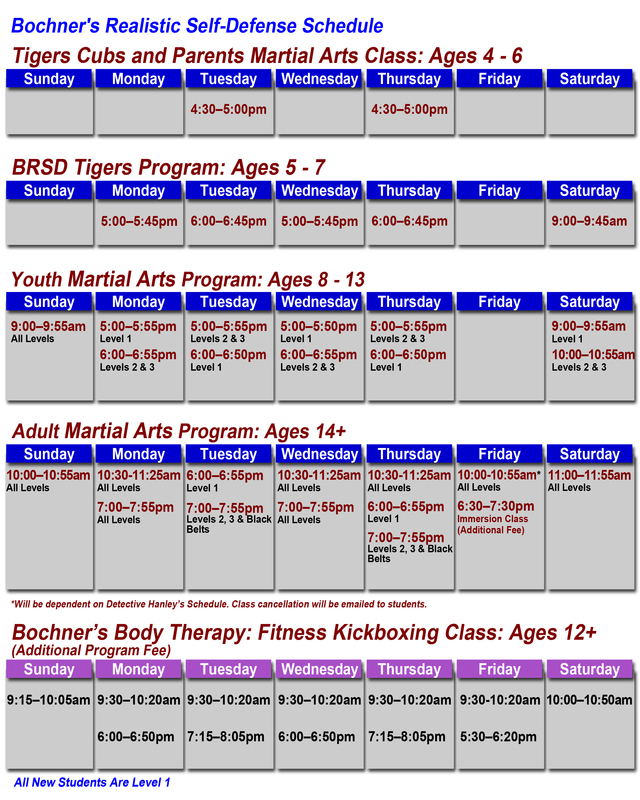 "Bochner's Realistic Self Defense is a great place to bring children or for yourself. They teach self-esteem, control, respect, responsibility, social skills and motivation. It is also a stress reliever. My 3 grandchildren go there. My grandsons for the last 9+yrs and my granddaughter Eliana for the last 1 1/2 yrs. When she started she was shy, intimidated by others watching her, she wouldn't participate in all parts of teaching because of it. She wouldn't grapple with anyone other than Sensei Marc and Sensei Beth. Now she participates in all aspects of her training and works very hard to achieve her goal. 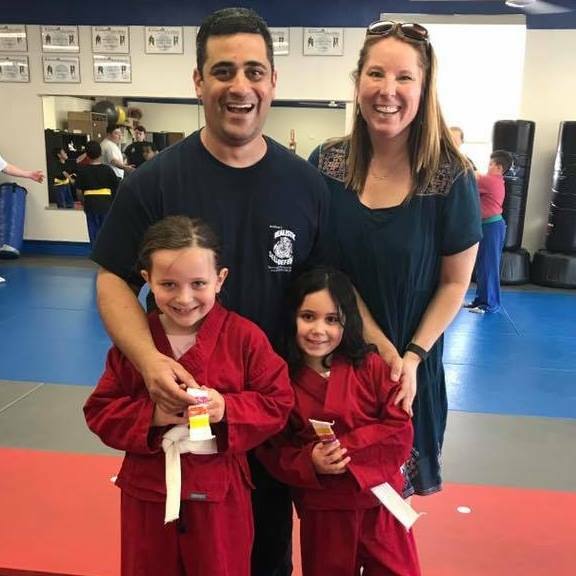 She started at 6 and is now 8 yrs old and is a yellow belt and thriving, she is no longer shy or intimidated by others, her motivation to go is reassuring. She now grapples with all instructors. I am so proud of her. Thank you Sensei Marc and The Bochner's crew for what you do for the children, young adults in helping them prepare for what life has to offer them. I feel like part of the team and have watched many children thrive and move to next part of their training. Us parents and grandparents cheer and praise all the lil tigers and older children. Come by and see for yourself you will not be disappointed. Thanks again Sensei Marc"
My kids have trained here for 5 years and It really is the best place around. The environment is so positive and fun, and it's really like it's own big family. Aside from the fun and creative ways that they teach practical skills, the school is true to its name. Bochner's Realistic Self Defense has taught my kids how to defend themselves in real-life situations, in a multitude of ways that they'll hopefully never have to use outside the dojo. It has been awesome to watch them gain confidence and a heightened awareness of their surroundings and interactions, as well as grow athletically, socially and academically. They're proud of their skill level and sometimes they'll even joke that they'll "protect me" as my own "personal ninjas", but really... they could! It's all I could want in an extra-curricular activity for my kids- they're learning something, having fun, and being active!! Now that they're in the adult class, it's rewarding to watch them develop their skills further and help teach others. I've learned a few things too! Hammer fist!!! I'm very grateful to have my family be part of this team. I started training here because I was getting bullied to the point I was at times afraid to go to school. This one kid, we will call “Richard”, tormented me every single day in school to my face and out of school on all my social media. There was no escape from “Richard”. “Richard” was a popular kid who boxed, he would come to me and throw jabs, grab me, corner me, etc. I felt like he was going to try to actually beat me up and I was defenseless. That's when I found BRSD! The community and family like environment made me feel safe, as I was coming in knowing very little and very intimidated on the whole fighting thing. I came every single day…for months! I had so much fun! I knew within 2 weeks that I could safely get out of a choke hold, a grab, and how to move if someone was throwing jabs. Within 2 months I was confident I could take on” Richard” and I was no longer scared of him. I'm not kidding when I say this place has completely changed my life. The techniques and understanding of how to defend myself in all typical situations has given me so much confidence in myself. I am no longer afraid of anyone no matter how big and strong. I don't plan on stopping my training ever! I love this place so much. As an experienced martial artist, focused on very traditional systems, I wanted to try something different and more practical self defense skills. I looked around and tried several different programs. I finally decided to give Bochner's Self Defense a try. I have been pleasantly surprised. Sensei Marc Bochner and his team have created a great environment for those with and without previous MA experience. The style can best be described as jujitsu. 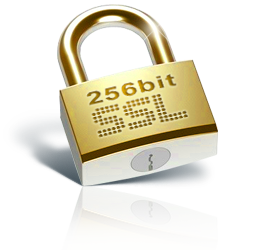 Many of his students and instructors have experience in many other systems. This brings a wealth and diversity of skills. What I enjoy the most is the support from instructor and students in every class. I am not interested in belt progression but it is a practical element for actual learning and skill progression. When you get a new belt I can say you have really earned it. I would recommend for anyone looking to learn practical self defense skills and willing to work hard and understand it is a long term commitment. I am so happy with Bochners Realistic Self Defense. I am disabled and cant use my left arm cause of a nerve desease called CRPS. I went to see Sensei Marc and told him my plans on getting stronger and learning to defend myself if the situation called for it, I didnt think anyone would help me out with my injury and all but Marc did. I cant say enough about this place. I am a city police officer and I started training Judo/Jiu-Jitsu over 25 years ago up in Boston, Massachusetts to better prepare myself for police work. I've been fortunate to meet and train with some very talented martial artists over the years. Sometime around March/April of 2014, I met Sensei Marc Bochner while I was visiting one of his students at his school. I not only noticed how talented Marc is, but I also studied how well his students were moving. Marc is without a doubt very talented, he is also very polite and professional. He truly believes in a no-nonsense approach to self-defense and he and his staff are very determined with helping others reach their self-defense and fitness goals. I joined Marc's school shortly after our meeting and I have definitely grown as a martial artist. I couldn't be happier with the results thus far and I look forward to the years of training ahead. I highly reccomend Bochner's Realistic Self-Defense Traing and Fitness Center. We know this is going to be an exciting, fun and maybe even life changing decision! Please email Ms. Cindy at MsCindyBRSD@gmail.com to set up your first class! We love meeting new, like minded people, who are commited to bettering themselves and their families!